It is our great honour and privilege to present to our readers four rare photos of Mawlana Sultan Mahomed Shah and Prince Aly Khan that have been in the collection of Mr. Jan Karmali of Edmonton, Canada, for many decades. The (5th) photo at the top of this page featuring Mawlana Shah Karim al Hussaini Hazar Imam and his younger brother, Prince Amyn Muhammed, with their mother Princess Joan (Tajuddawlah) Aly Khan, is also from Mr. Karmali’s collection. Readers may have come across this photo in numerous publications; however the photo shown here is of a better quality than other reproductions we have seen over the years, because it is from the original print. 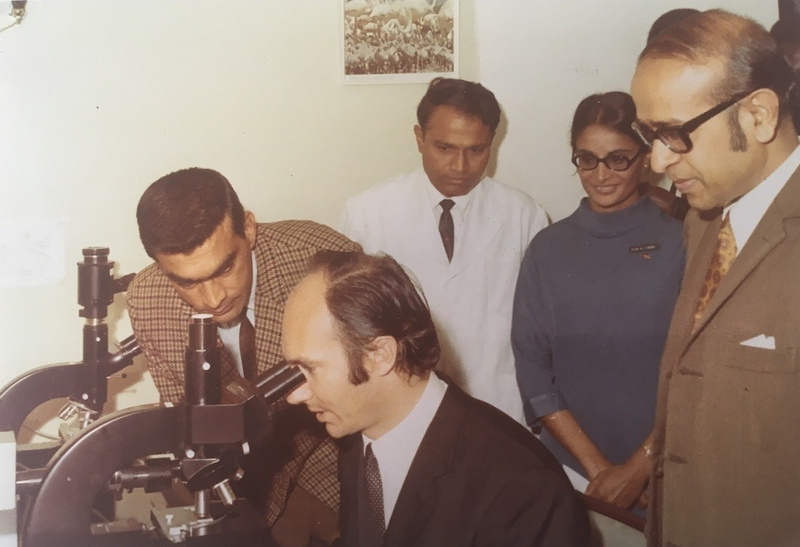 The 6th and final photo with Mawlana Hazar Imam looking through a microscope is a much recent one taken in 1971. It is only 48 years old, compared to the other 5 photos that are from the 1930’s/1940’s and 80 years old. These precious photos were brought to our attention through the enthusiasm of Amin Jaffer of Edmonton. Being in the same city as Jan Karmali enabled Amin to make scans of the original photos as well as coordinate with Jan Karmali to prepare annotated versions which include names of several individuals in the group photos. We commend Jan Karmali and Amin Jaffer for their magnificent work. We sincerely hope that our readers around the world, who will be seeing some of these photos for the first time ever, will be inspired by Jan Karmali’s contribution and take the time to search through their archives and old photo albums, and submit digitized photos from their collections for publication on Barakah (email: simerg@aol.com). If this not done, historical photos like the ones we are seeing on this page – and many we have published previously from other private collections – will be lost forever either because they have been largely forgotten or damaged due to environmental reasons. Digitization is one part of a larger process of preservation that’s at the core of promoting cultural heritage . Locating old photographs, may also unfold remarkable and unique historical memories. We also urge readers never to recycle our community magazines, but to preserve them for posterity. Future generations will be curious about the decades gone by, and one of the best gifts we can leave behind are preserving original prints and magazines that will revive memories of our history. 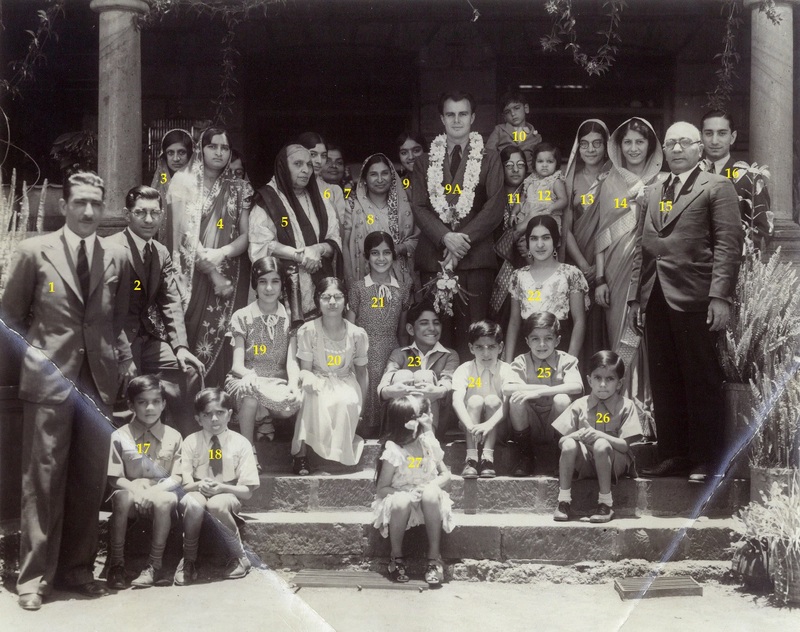 In the late 1930s when the pictures were taken, there weren’t many Ismailis residing in Nairobi. Jan’s father, Karmali Mohamed, and his brother, Ahmed Mohamed, ran a business under the name of Ahmed Brothers on Bazaar Street. They had a monopoly on supplying the British Army with uniforms, tents and tent supplies etc. They had very good relations with the officers of the army. Karmali Mohamed had served as an officer with the British Army during the 1st World War. Imam Sultan Mahomed Shah, His Highness the Aga Khan, was very fond of going to the National Parks to watch the wild life as well as hunting. Karmali Mohamed who had rifles went as a guide to the parks. Sir Eboo Pirbhai who had a taxi business drove their car. Mawlana Hazar Imam’s father, Prince Aly Khan, as is well known was very much into driving fast cars. He would ask leaders to arrange racing safaris in which he would participate. In one of these races Prince Aly Khan drove a Chevy car supplied by Motor Mart, with Karmali Mohamed as a passenger. The car overturned and suffered extensive damage; both of them were luckily not hurt. Jan had four brothers and five sisters. The eldest brother John (Shamshudin) and Haji ran a business under the name J. S. Karmali Ltd. They dealt in photographic and medical equipment. As a matter of fact, Haji was the only optical engineer in East Africa to be trained by Ernst Leitz Wetzlar of Germany, the manufacturers of Leica Microscope and other photographic instruments. His brother Najmi had a construction company and Jan himself had a photo and framing shop in Arusha, Tanzania. Jan Karmali is now 86 years old and lives with his wife Fatma in Edmonton. They have three sons – Mohamed Ali, Salaudin and Hafiz. Today, as Jan Karmaili shares this collection with Barakah’s readers, he takes the opportunity to pay a tribute to his late father, Karmali Mohamed, through the following image of medals which were presented to him by the British Army whom he served during World War I when he was around 18. Medals presented to Karmali Mohamed for his services during the 1st World War. In 1937, at the time of Golden Jubilee of Imam Mawlana Sultan Mahomed Shah, he would go to the houses of jamati members and meet the families. In many cases he would sit with families and have pictures taken. Photo: © Jan Karmali Photo Collections, Edmonton, Alberta, Canada. Photo: © Jan Karmali Photo Collections, Edmonton, Alberta, Canada. See next image for annotated version. 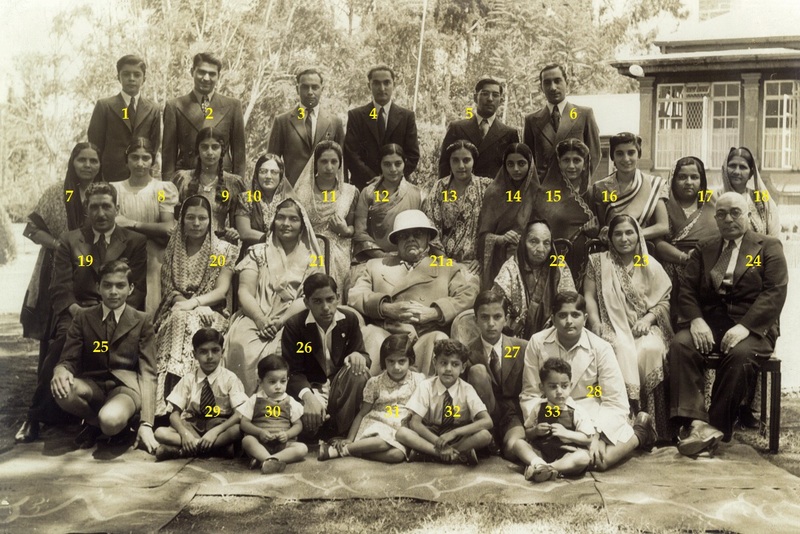 This picture (annotated version, below) was taken at the Pangani House of Jan’s father, Karmali Mohamed. 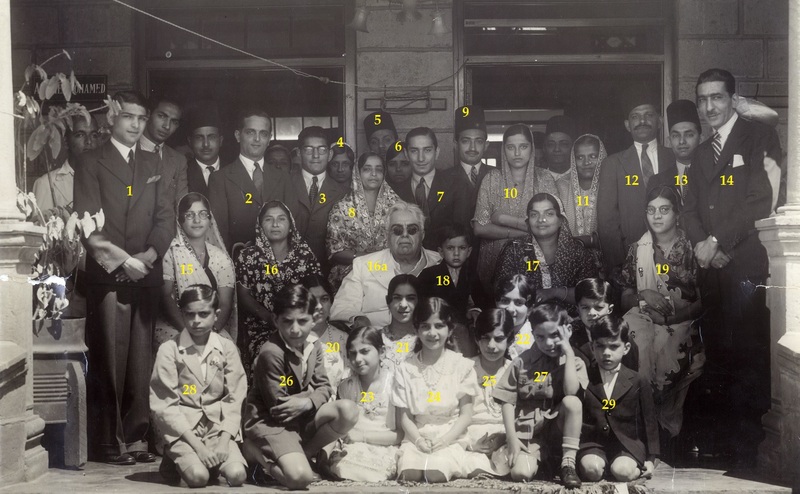 When every one was taking up their positions for the photographer, Jan could not find a place and started sobbing and going towards his mother (sitting on right hand side of Mawlana Sultan Mahomed Shah, see person numbered 16 in annotated photo). The Imam called Jan and asked him to sit on his lap (18 in annotated photo). The exact words Imam used in Urdu were “idar asaani se betho” (sit here in comfort). Jan Karmali was then five years old. Mawlana Sultan Mahomed Shah in group photo in front of Ahmed Mohamed’s Pangani House (house plaque partially visible at top left). Persons in the photo: 1. Shamshudin Ahmed Mohamed 2. Valibhai Goa 3. “Tommy” Sultan Ahmed Mohamed 4. Khatibai Husein Habib Pradhan 5. Husein Habib Pradhan 6. Mrs. Sonbai Gulamhusein Alibhai Pradhan 7. “Jimmy” Badrudin Ahmed Mohamed 8. Shambulibai Hussein Merali Janmohamed 9. Kassam Dhanani 10. Malekbai Kassam Dhanani 11. Mrs. Shariff Pradhan 12. Shariff Pradhan 13. Husein Nurmohamed Abba 14. Varas Karmali Mohamed 15. Dolubai Ahmed Mohamed (Mrs. Valibhai Goa) 16. Kursabai Ahmed Mohamed 16a. MAWLANA SULTAN MAHOMED SHAH, HIS HIGHNESS THE AGA KHAN 17. Jenabai Karmali Mohamed 18. Jan Karmali 19. Nurbanu Karmali 20. Mohamed (Mrs. Husein Nurmohamed) 21 Sherbanu Karmali Mohamed (Countess Gulamali Rajan) 22. Roshan Ahmed Mohamed (Mrs. Madatali Ebrahim) 23. Shirin Karmali Mohamed (Mrs. Badrudin Kara Kanji) 24. Gulshan Ahmed Mohamed (Mrs. Ismail Kassam Kanji) 25. Laila Karmali Mohamed (Mrs. Shamshudin Ahmed Mohamed) 26. Malek Karmali Mohamed (Mrs. “John” Issa Ismail Janmohamed) 27. Tajdin Ahmed Mohamed 28. Taleb Ahmed Mohamed 29. Najmi Karmali Mohamed. Please click on photo for enlargement. Photo: © Jan Karmali Photo Collections, Edmonton, Alberta, Canada. Mawlana Sultan Mahomed Shah in group photo taken in the late 1930’s or early 1940’s in front of Karmali Mohamed’s Parklands House, Nairobi, Kenya. Persons in photo: 1. Najmi Karmali Mohamed 2. Shamshudin Ahmed Mohamed 3. Husein Nurmohamed Abba 4. Badrudin Kara Kanji 5. Sultanali Ahmed Mohamed “Tommy” 6. Badrudin Ahmed Mohamed “Jimmy” 7. Mongibai Kara Kanji (mother of #4 above) 8. Gulshan Ahmed Mohamed 9. Laila Karmali Mohamed 10. Khatoonbai, Mrs.Hussein “Bofflo” (Dar es Salaam) 11. Roshan Ahmed Mohamed 12. Sherbanu Karmali Mohamed – Countess Gulamali Rajan 13. Shirin Karmali Mohamed – Mrs. Badrudin Kara Kanji 14. Sakar, Mrs. Tommy Ahmed 15. Parin Jimmy Ahmed 16. Malek Karmali Mohamed – Mrs. John Janmohamed 17. Zarakhanu Lutafali Merali 18. Countess Rajan Lalji 19. Varas Karmali Mohamed 20. Nurbanu Karmali Mohamed (Mrs. Hussein Nurmohamed) 21. Jenabai Karmali Mohamed 21A. MAWLANA SULTAN MAHOMED SHAH, HIS HIGHNESS THE AGA KHAN 22. Fatmabai Mohamed Pradhan 23. Kursabai Ahmed Mohamed 24. Count Ahmed Mohamed 25. Haji Karmali Mohamed 26. Taleb Ahmed Mohamed 27. Jan Karmali Mohamed 28. Taju Mohamedali Dhalla 29. Abdul Husein Nurmohamed 30. Karim Gulamali Rajan 31. Name not available 32. Shamsh Husein Nurmohamed, 33. Mehmood Sultanali Ahmed. Please click on photo for enlrgement. Photo: © Jan Karmali Photo Collections, Edmonton, Alberta, Canada. Photo: © Jan Karmali Photo Collections, Edmonton, Alberta, Canada. See next photo for annotated version. 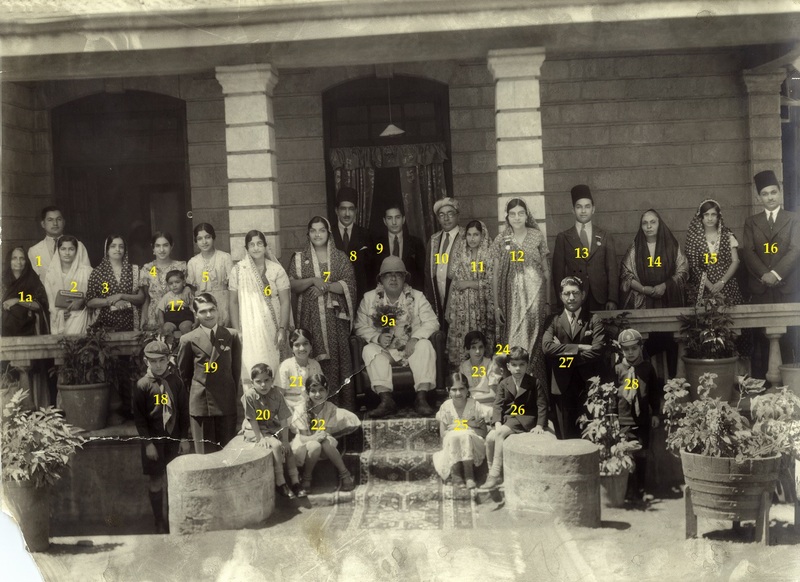 Mawlana Sultan Mahomed Shah in group photo taken in 1937 in front of Karmali Mohamed’s Nagara House. Persons in photo: 1. Name not available 1a. Name not available 2. Name not available 3. Shambulibai Husein Merali Janmohamed 4. Roshan Ahmed Mohamed (Mrs. Madatali Ebrahim) 5. Sherbanu Karmali Mohamed (Countess Gulamali Rajan) 6. Dolubai Ahmed Mohamed (Mrs. Valibai Gova) 7. Jenabai Karmali Mohamed 8. Karmali Mohamed, Varas 9. Badrudin Ahmed Mohamed, “Jimmy” 9a. MAWLANA SULTAN MAHOMED SHAH, HIS HIGHNESS THE AGA KHAN 10. Count Ahmed, Mohamed 11. Kursabai Ahmed Mohamed 12. Nurbanu Karmali Mohamed (Mrs. Hussein Noormohamed) 13. Husein Nurmohamed Abba 14. Fatmabai Mohamed Pradhan 15. Khatibai Husein Habib Pradhan 16. Hussein Habib Pradhan 17. Name not available 18. Tajdin Ahmed Mohamed 19. Shamshudin Ahmed Mohamed 20. Taleb Ahmed Mohamed 21. Shirin Karmali Mohamed (Mrs. Badrudin Kara Kanji) 22. Laila Karmali Mohamed (Mrs. Shamshudin Ahmed Mohamed) 23. Malek Karmali Mohamed (Mrs. “John” Issa Ismail Janmohamed) 24. Jan Karmali Mohamed (looking away from camera) 25. Gulshan Ahmed Mohamed (Mrs. Ismail Kassam Kanji) 26. Haji Karmali Mohamed, 27. “Tomy” Sultanali Ahmed Mohamed 28. Najmi Karmali. Please click on photo for enlargement. Mohamed. Photo: © Jan Karmali Photo Collections, Edmonton, Alberta, Canada. Prince Aly Khan in group photo taken in 1937 in front of Ahmed Mohamed’s Pangani House. Persons in photo: 1. Varas Karmali Mohamed 2 “Tommy” Sultanali Ahmed Mohamed 3. Khatibai Husein Habib Pradhan 4. Shahsultan Mohamedali Dhalla 5. Fatmabai Mohamed Pradhan 6. Sherbanu Karmali Mohamed (Countess Gulamali Rajan) 7. Jenabai Karmali Mohamed 8. Kursabai Ahmed Mohamed 9. Shirin Karmali Mohamed (Mrs. Badrudin Kara Kanji) 9A. PRINCE ALY KHAN 10. Abdul Vali Gova 11. Dolubai Ahmed Mohamed (Mrs. Valibai Goa) 12. Shirin Vali Gova (Walji’s Travel – Islamabad) 13. Nurbanu Karmali Mohamed (Mrs. Husein Nurmohamed) 14. Parin Badrudin Ahmed Mohamed “Jimmy” 15. Count Ahmed Mohamed 16. Badrudin Ahmed Mohamed 17. Haji Karmali Mohamed 18. Taju Mohamedali Dhalla 19. Malek Karmali Mohamed (Mrs. “John” Issa Ismail Janmohamed 20. Gulshan Ahmed Mohamed (Mrs. Ismail Kassam Kanji) 21. Laila Karmali Mohamed (Mrs. Shamshudin Ahmed Mohamed) 22. Roshan Ahmed Mohamed (Mrs. Madatali Ebrahim) 23. Tajdin Ahmed Mohamed 24. Taleb Ahmed Mohamed, 25. Najmi Karmali Mohamed 26. Jan Karmali Mohamed 27. Name not available. Please click on photo for enlargement. Photo: © Jan Karmali Photo Collections, Edmonton, Alberta, Canada. 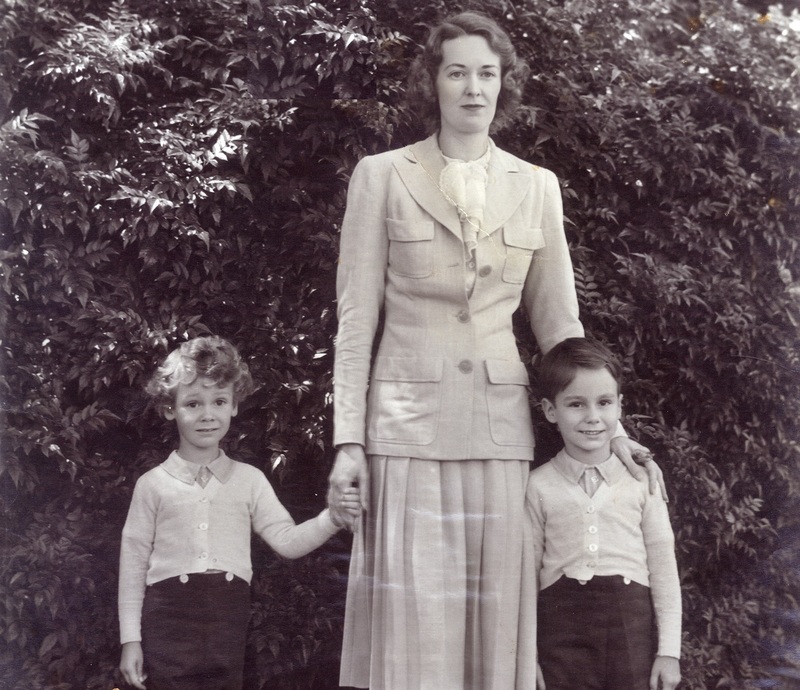 Prince Amyn Muhammad (left) and Mawlana Shah Karim pictured with their mother Princess Tajuddawlah (April 22, 1908 – April 27, 1997) during their childhood years in Nairobi, Kenya. Click on photo for enlargement. Photo: Jan Karmali Collections, Edmonton, Alberta, Canada. John and Haji Karmali had a business of photographic and medical supplies. In this photo taken in 1971 in Nairobi, Haji is demonstrating a microscope to Mawlana Hazar Imam which the two brothers had donated to the Aga Khan Hospital. Click on photo for enlargement. Photo: Jan Karmali Collections, Edmonton, Alberta, Canada. Date posted: April 4, 2019. Before leaving this website, we ask that you spend a few moments viewing Barakah’s Table of Contents where we have links to more than 150 marvellous pieces on Mawlana Hazar Imam and his family. Dear Malik: This is a great rare treasure you have posted on Barakah. May Mawla always be happy with your and Jan Karmali’s families’ as well as Amin Jaffer for the contribution he has made. I say this from the bottom of my heart and soul. A picture is worth a million word!s I for one got extremely fascinated by the facial expressions, the dress code and seating arrangement; we must never forget where we have come from. I plan to share with my children and grand children; thanks for archiving our past in pictures and sharing them. Thanks to all those who, like Mr. Jan Karmali, have and today still do keep all the pictures and history of our Imams. I would really like to see Mawlana Sultan Mahomed Shah’s picture when he was 20/30 yrs old, if anyone has it, please share it. Please click on https://simerg.com/about/voices-sir-sultan-muhammad-shah-aga-khan-iii-portraits-from-the-national-portrait-gallery/ for portraits of the 48th Imam including one that was taken in 1911 when he was 34 years old. Mr. Jan Karmali: This is an enormous contribution; these photos are truly rare. Our salute to you for preserving these photos and our history so well. Great collection, recollects history and a lot more to the individuals here with Imam of the Times.